BHD syndrome causes lung cysts and collapsed lungs (Spontaneous pneumothorax). 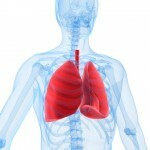 Lung cysts are sacs of air that form on the surface of the lung. In BHD patients, cysts are more common in the lower half of the lung and do not, by themselves, affect how well your lungs function. 9 in 10 people with BHD have lung cysts. 1 in 4 people with BHD have at least one episode of pneumothorax. Normally, collapsed lungs are caused by an injury, but in BHD patients they occur spontaneously, without injury. Hence this is called a “spontaneous pneumothorax”. Collapsed lungs are normally not life-threatening, so long as they are treated as soon as possible. It is important to know if you have BHD so that you are aware you are at risk of getting a collapsed lung and know the symptoms to look out for. If you, or any members of your family, have had a spontaneous pneumothorax, or have been told they have lung cysts, it is possible that BHD runs in your family. The best way to know if you have BHD is to have a genetic test.